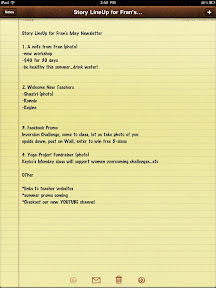 Above is an outline I used to organize a recent client newsletter for Menlo Pilates and Yoga. Thinking in terms of departments and features can really help you clarify and target your content, as well as plan for future issues. I was recently asked the question, "how do you get people to turn their articles in?" One guaranteed way not to get your copy in, is to surprise your contributors with rush deadlines. Conversely, organizing and distributing a schedule well in advance of the publication date, will ensure that those contributing content -- whether it be articles, photos, video, etc.,will get it in on time. Set up a system of reminders, either via e-mail, phone, or in person, and make sure those who are contributing articles are clear on their topics and focus. A little trick I learned early on, is to publish author photos and bylines along with the article. No one wants their photo published next to a blank column! By having set columns each issue, you can more easily organize, assign, and structure your content. For example, in my monthly e-news, The Butterfly, I always publish a mini editorial called "Monarch Notes," and I keep a notebook with me so if I get ideas for me editorial between issues, I can easily jot them down. Interviews, "cool tools," product or book reviews, and any promotions, coupons, or sale items, are other common newsletter elements, and some programs, such as Constant Contact, have coupons built into many of the templates. Other structural elements include the newsletter title and masthead, or logo, tagline, feature or guest column, issue # and date, and table of contents, which can be optional. I find that even with a short newsletter of just a few stories, it's helpful to write out a list of stories set to run, along with comments or notes on what graphics will accompany the article. Sometimes graphics can inspire their own story ideas, so be on the lookout for great images when you're between issues. I like to keep a photo or image folder for each issue, and that way the artwork is ready to go once you start the issue. Also keep in mind and even circle with a red pen, any resources you want to link to. If your layout program is cloud-based, or even relies on dedicated software, you're going to want a separate file that you can use to copy and paste your stories once they've been edited and proofed. In that way, you have your original text as a backup in case you encounter a software glitch or any other 3rd party technical snafu. said "Happy Labor Day Weekend!" Ouch. These are just a few tips to help you get started, and I'm sure there are more to be added to the list. What tips and tricks do you use to help you more easily publish your newsletter? Feel free to post a comment here.